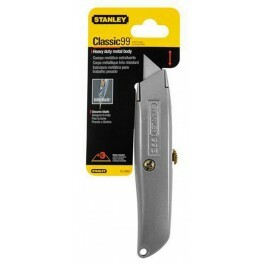 The Stanley Original 99E Retractable Blade Knife is the one and only original Stanley retractable knife. The interlock nose firmly secures the blade into the knife, whilst the precision die cast zinc body provides both strength and lightweight use. The knife offers 5 blade positions and allows a wider usage for a variety of cutting applications. Spare blades are stored inside the handle. Comes complete with 3 replacement blades.